Mighty Morphin Power Rangers foi uma febre na época que saiu o primeiro da série! Depois de sempre querer desenhá-la e sempre andar adiando... Finalmente fiz esta arte como tributo para a THUY TRANG a Trini a melhor Yellow Ranger de todas! Mighty Morphin Power Rangers was a fever at the time it came out the first series! Once you always want to draw it and walk always putting off ... 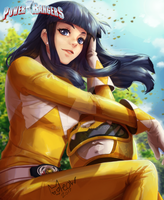 Finally I made this art as a tribute to THUY TRANG the Yellow Ranger Trini the best around! I really like your art style on Trini. very nice, dude. or are you a dudette?